Intelligence analysts face incredible challenges in detecting growing threats by analyzing overwhelming amounts of "Big Data." Using traditional tools and manual approaches, analysts are trying to find that "needle in a haystack" based on only a few fragments of data. In 2012, SAS participated in the US government's "Identity Discovery Challenge" and delivered the right answers and relevant supporting details to win the Challenge. 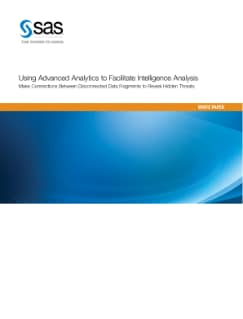 This paper explores how government agencies can leverage advanced analytics to link disconnected data and provide answers to complex questions. Rather than requiring analysts to know precisely what to look for at any given moment, advanced analytics with built-in alert systems can be set up to proactively identify, prioritize and present information to analysts based on pattern identification and quantification of risk.